This trip provides an exciting introduction to the country's diverse wilderness areas, with a good likelihood of spotting a variety of fascinating animals offered in such a variety and abundance it’s unbelievable. Through the Rift Valley is Kenya’s shorter safari. 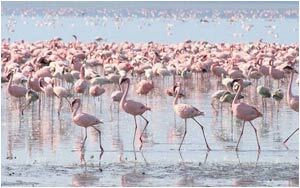 The Rift Valley lakes are famous for their abundance of flamingos and other waterfowl, whilst the Masai Mara is home the country's greatest concentration of big game. Day 01: Nairobi – Lake Nakuru. Depart Nairobi in the morning and drive down the escarpment a brief stop at the View Point and head down to the floor of the breathtaking escarpment. Arrive at Lake Nakuru for lunch. Afternoon game drives in Lake Nakuru, one of the few Ramsar sites in the world. The park is a sanctuary of the endangered black rhinos. During the game drive you will visit Makalia falls, Baboon cliff and the Euphorbia forest. Dinner and overnight at your lodge / Camp. Hotel options: Sarova Lion Hill Lodge / Lake Nakuru Lodge / Flamingo Hill Camp. Day 02 : Lake Nakuru – Masai Mara. After breakfast head south west for Masai Mara Game Reserve. The Masai Mara Game Reserve is Kenya’s finest Game Reserve. Your first sight of this incredible natural wonderland is breathtaking; the landscape rolls away in endless savannah, ensuring that the abundant wildlife are never out of site. Later proceed for an afternoon game drive. Hotel options: Mara Serena Lodge / Mara Sopa Lodge / Mara Simba Lodge / Sarova Mara Tented Camp. During the morning and afternoon game drives you will explore the parks amazingly high concentration of game. This game reserve is Kenya's finest wildlife sanctuary. Including migrants, well over 450 species of animals have been recorded here. Although July, August and September are the months when the Mara plains are filled with migrating wildebeest and zebra, there is also resident wildlife year round. The famous Masai tribesmen live within the dispersal area of the game reserve. Depart from the camp in the morning and drive north while viewing game and make a stopover at Narok town with a chance to buy a souvenir to arrive back in the city by afternoon. Lunch Carnivore Restaurant. Drop off at the hotel / Airport. Transport in a 7 seater tour van and game drives.